Although he managed to escape Paris – and starvation – during the Prussian siege in the fall of 1870, the French novelist Émile Zola returned to the city in March 1871, in time to witness the bloody rise and fall of the Paris commune. The following year he moved to Les Halles where he wrote Le Ventre de Paris (The Belly of Paris), set in the capital city’s great central food market. Often identified as the first gastronomic novel, the Belly of Paris is more than a foodie reverie, it’s a political cri de coeur, as serious as the author’s later condemnation of the Dreyfus Affair. In page after page thick with luscious descriptions of cabbages, turbots, and boudin noirs, Zola’s third novel strives to convey the moral ambiguity of the French cult of gastronomy. 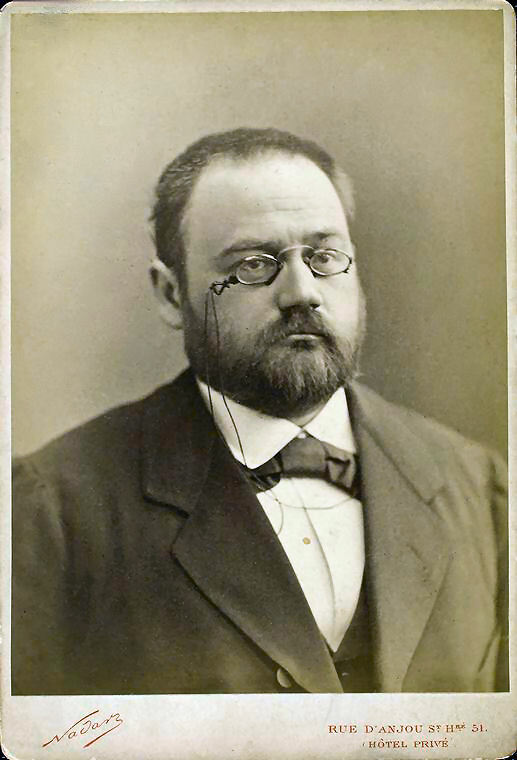 Émile Zola was not a thin man, at least not by the time he wrote The Belly of Paris. In his youth, this son of Provence may have lived off bread and olive oil like his childhood friend Paul Cézanne, but by his early thirties, when he wrote The Belly of Paris, he had secured enough income from his writing to eat decently. And he very much liked to eat well. In 1874, Zola along with his friends Gustave Flaubert, Ivan Turgenev, Alphonse Daudet, and Edmond de Goncourt, started a monthly Dinner of Hissed Authors where they dined on specialties like canard à la presse, caviar, and bouillabaisse. They had their multi-hour feasts at many of the finest restaurants of the day, including Voisin’s, Café Riche, and Adolphe & Pelé’s, a restaurant behind the Opéra. Zola was especially partial to shellfish and sea urchins. When the author’s friends made fun of his love of fine food he admitted to his weakness, but pleaded that gourmandise was his only vice. The Belly of Paris could only have been written by someone who loved food. Who else could come up with so many similes to convey the beauty of the humble cabbage, which was a staple of the vegetable sellers at Les Halles? Zola describes them as looking like “crimped pieces of green velvet,” like “basins of greening bronze,” and like “exquisite flowery masses the color of wine, crimson and deep purple.” Cauliflowers receive the same adoring gaze. In one sentence spanning three similes, Zola describes “gigantic cauliflowers, stacked with surprising orderliness like cannonballs, the delicate white cauliflower flesh opened like enormous roses, surrounded by large green leaves, so that the mounds resembled bridal bouquets on display on a flower stand.” So too are carrots, leeks, turnips, chicory, and onions painted in such vivid color that to read the novel is almost to gaze upon a massive still-life, such as the painting that Zola’s character Claude Lantier, based on Cézanne, talks of creating in the book’s early pages as he and the hero, Florent, wander Les Halles. Florent has just illegally returned from seven years exile in Suriname, where he had been sent after being captured on the barricades during the failed 1851 uprising against Louis-Napoléon Bonaparte. Florent wanders the streets, starved and confused, searching for his brother’s old address, but the map of central Paris has been drastically altered during his absence by the construction of Les Halles, a complex of twelve enormous pavilions built to house the city’s central food market (which had occupied the center of Paris for eight centuries). Unfortunately, Les Halles operated better as an idealized space than as a physical reality. The center of the city simply could not capacitate the level of traffic moving to and from the market each day, especially as Paris expanded during the late nineteenth and twentieth centuries. 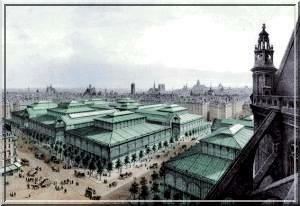 The population of Paris grew from 1.5 million to 2.2 million just in the two decades after Les Halles was built. Eventually, in 1969, the Mitterand government decided to tear down the old pavilions and move the market south of Paris to Rungis, near Orly airport. A subterranean mall was built in the old pavilions’ place, creating an eyesore that the city of Paris is trying to remedy today. Although it took one hundred years to tear the buildings down, the problems with Les Halles were apparent to all immediately after their construction. 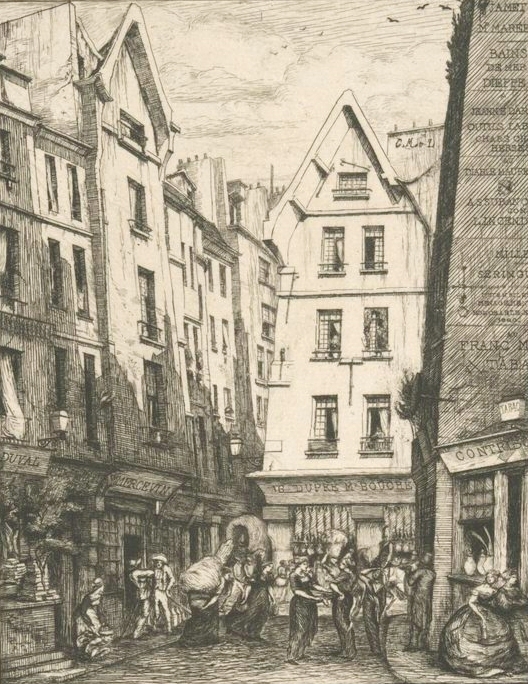 On his re-entry to the city, Florent finds himself caught up in the slow-moving horse-cart traffic heading to the market, and he witnesses the frayed tempers (road rage) of the drivers. Soon he also hears the complaints from marchands that the pavilions are too cold in the winter, too hot in the summer, and too odorous all year round. The caves beneath the pavilions are suffocating in their stenches. 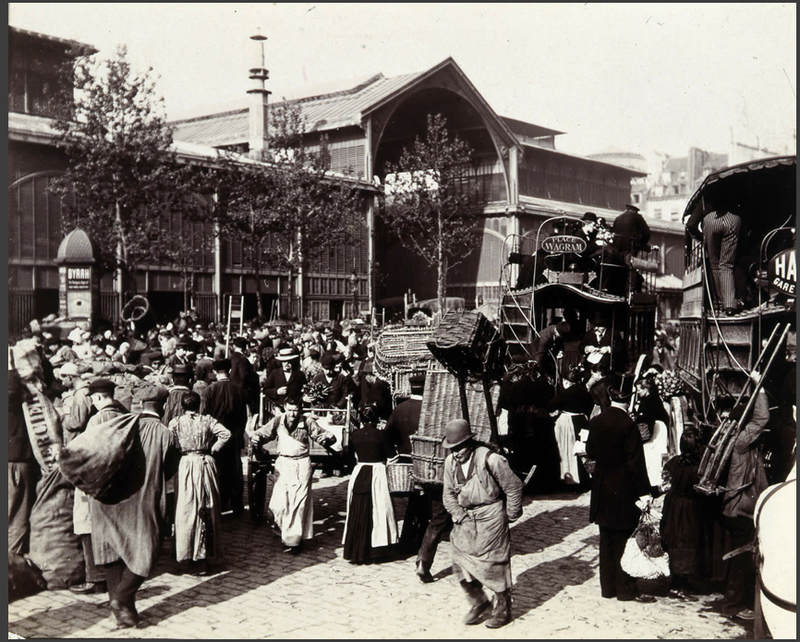 In The Belly of Paris, Zola’s real critique of Les Halles, however, has less to do with the buildings’ engineering than with the political and social injustices that the market both symbolizes and reinforces. As Claude explains to Florent near the end of the novel, the world is divided into the Fats and the Thins. Les Halles is run by the fats for the benefit of the other Fats. Zola paints the markets’ superabundance as a grotesque affront in view of the fact that so many Parisians were too poor to feed themselves. At the other end of the spectrum, those who did have enough wealth to eat well were so placated by the market’s mountains of food that they did not bother to protest the political oppression they suffered under Louis-Napoléon’s regime, nor the physical deprivations of their fellow men. “Passive people had never been so well fattened,” Zola observes. Florent, who returns from exile with a sense of moral clarity about the need for a socialist revolution against the injustices of Louis-Napoléon’s corrupt dictatorial regime, is horrified to feel the “seduction of fat slowly invading his entire being, rendering him soft and easy,” after he moves in with his brother Quenu, a successful charcutière who runs a shop across the street from Les Halles. The descriptions of meat in the novel can be just as beautiful as the descriptions of vegetables, but they can also be brutal. Zola celebrates the beauty of Quenu’s shop window, filled with (in the author’s words) pork chops, garlands of sausages, rows of crocks filled with rillettes alternating with jars of mustard, round boned jambonneaux with golden breadcrumb coatings, stuffed Strasbourg tongues all red and looking as if they had been varnished, boudin coiled like snakes, andouilles piled two by two and plump with health, dried sausages in silvery casings lined up like choir boys, pâtés, still warm, with little labels stuck on them like flags, big, fat hams, thick cuts of veal and pork whose juices had jellied clear as crystal candy, minced and sliced meats sleeping under blankets of fat, and pickling jars of sauces and stocks and preserved truffles, terrines of foie gras, and tins of tuna and sardines. Later, when Florent visits the meat market at Les Halles, he views the slaughtered animals through the same prism of horror, gazing with distress at (in Zola’s words) the deer with their heads hanging down, their front legs broken and twisted around their necks, larks strung in garlands around the shop like necklaces worn by savages, large rust-colored partridges, fat geese hung from spiked bars above him, hooks plunged into bleeding wounds in their long stiff necks, and their enormous red bellies under fine down ballooned out like obscene nudes as white as linen from tail to wings, rabbits with their heads showing sharp teeth and terrified eyes vivid with the laughing grimace of dead animals, pigeons pressed together on a wicker frame, exposing the tender naked skin of new-born babies, and piles of severed rabbits’ paws. The beautiful window display at Quenu’s charcuterie, Zola suggests, obscures the savage slaughter that fills its crocks and cauldrons, just as the overflowing bounty of Les Halles stultifies the senses of the bourgeois, blinding them to the injustices of Louis-Napoléon’s Second Empire. The celebrated cuisine française embodied by Quenu’s prototypical andouillettes and rilettes is revealed in The Belly of Paris to have a poisonous side. 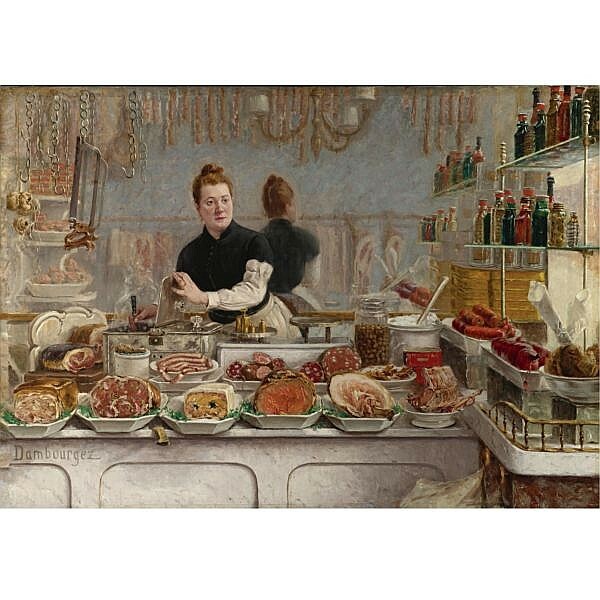 What give Zola’s novel such power is his gourmand’s ability to convey the animal pleasures of good food, which a “Thin” like Florent could never understand, while at the same time revealing the cult of gastronomy’s implication in a corrupt society of haves and have-nots. Few food writers today seem to capture both these sides of gastronomy. The past decade and a half have witnessed a foodie revolution in the United States, as bourgeois American culture has become increasingly obsessed with local, organic, craft, heritage, heirloom, artisanal, bespoke food. Hand-cut pickles, small-batch coffee, korobuta hot dogs with seaweed and terimoya sauce: the tastes of the well-to-do have become more refined with each passing year in an era that has also witnessed the expansion of America’s surveillance state beyond what anyone but the most paranoid could predict, and the ever-widening gap between the nation’s poor and everyone else. Where is the food writer today who is bringing these two shifts into conjunction: the modern cult of gourmandise and American political passivity in the face of expanding surveillance and poverty? There are many vocal critics of American food policy, industrial agriculture, and social inequality, but gourmandise itself seems to go unquestioned. The bountiful contemporary food-writing that evokes the pleasures of the table, as Zola does inThe Belly of Paris, shows little of his appetite for investigating the table’s poisons. 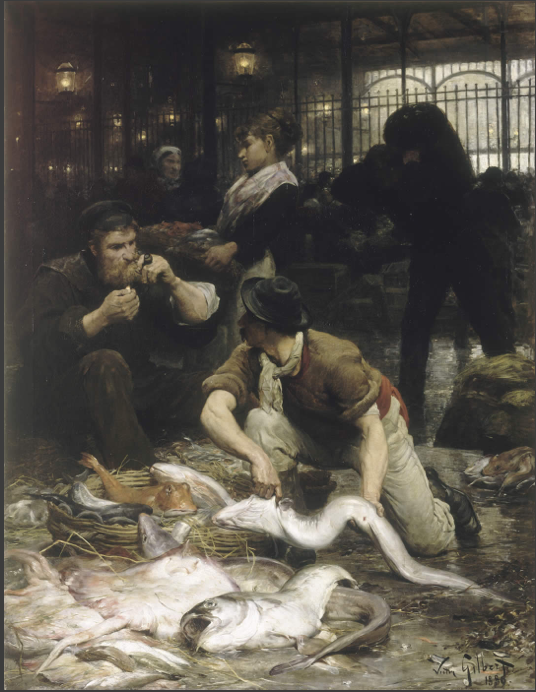 Zola could not turn a blind eye; he could not fail to be astonished by the sight of Les Halles’ abundance during his 1872 residency, so soon after returning to the post-siege city and seeing the starved condition of those Parisians who stayed, so soon after witnessing the terrible bloodshed during the suppression of the commune. Like Florent, he returned with a sense of moral clarity, even if – unlike Florent – he himself succumbed to the seduction of fact and soon picked up the fork and knife once more. Love this piece of French marche history. oth film and huge old photos blown up including the final rubble and dust. Very powerful. Do you mean the Doisneau show? I wish I’d seen it. The show was still on when we arrived in August, but I didn’t hear about it in time. It is true, isn’t it, that the themes in The Belly of Paris are as relevant in the US today as they were in France when it was written. Also, Zola’s writing is just as powerful – reading Germinal left me feeling hungry and weak. Reading The Belly of Paris just leaves me hungry.